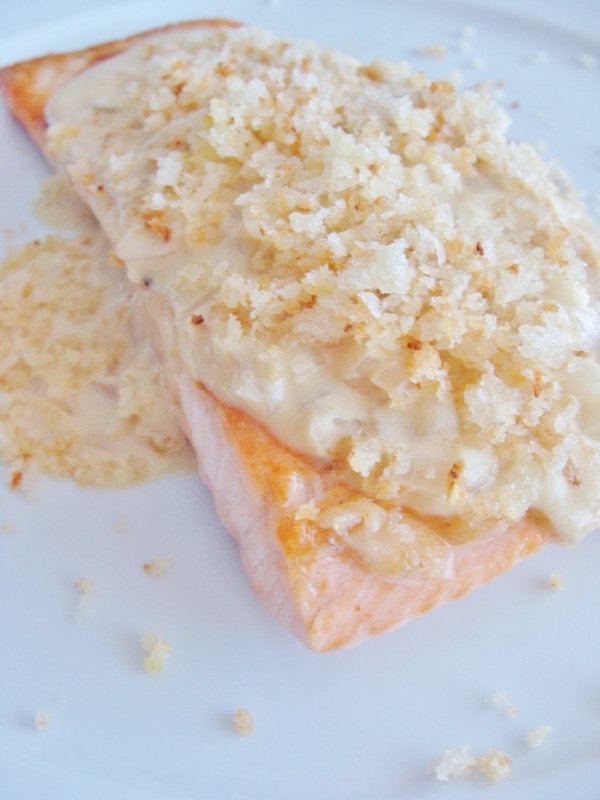 sautéed salmon with light dijon mustard sauce and toasted breadcrumbs. So I just got back on Tuesday evening from a long weekend in San Antonio, Texas. It was my first visit to Texas, so I was excited to cross another state off my “list.” I didn’t know what to expect, but I really enjoyed San Antonio. I was totally shocked to see palm trees on our taxi ride from the airport to our hotel on the River Walk. I guess I didn’t realize how far South we actually were! Temperatures reached 70 several days, the sky was a brilliant blue–it was lovely. Our hotel was on the River Walk, which is very neat, lined with restaurants that offer plenty of outdoor seating, and small tour boats that travel up and down the river from early morning to late evening. I was thrilled because we got to do a lot of walking. I may or may not have dragged Ty on many a stroll up and down the River Walk. Stuff a taco in my face, walk a while, stuff another taco in my face… you get the picture. We ate CONSTANTLY and it was WONDERFUL. I will be doing a recap of our San Antonio meals at some point. But right now, we’re going to talk about something else. Not tacos or chips and salsa–oh so much chips and salsa. We’re talking about salmon! The fish I’ve learned to tolerate. I am not a huge fish fan. Basically, if I eat fish, I don’t want it to taste like fish. Which is why this recipe makes me so happy. 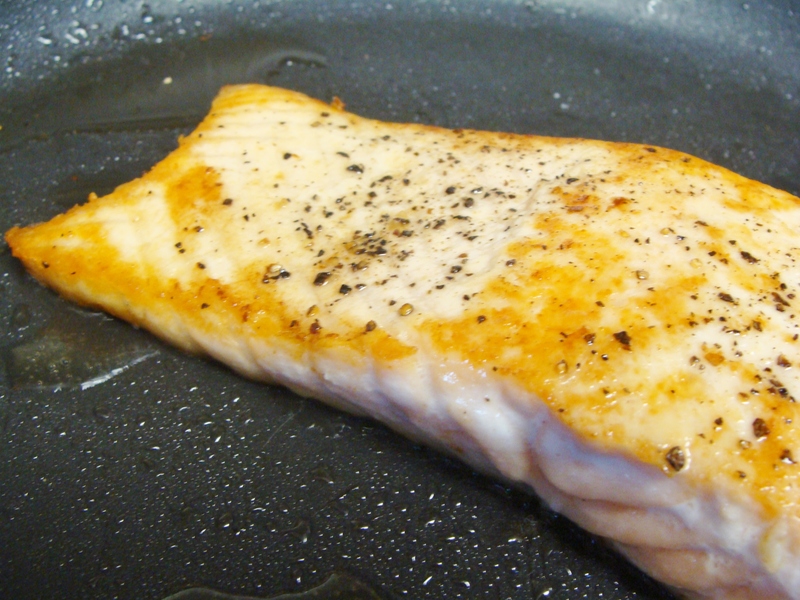 The fish is sauteed in a hot skillet for about 12 minutes, and topped with a light (truly light!) dijon mustard sauce and crispy breadcrumbs. So many wonderful flavors to distract me from the fact that I am eating fish. Also, this is a quick fix for a weeknight, especially if you prepare your sides ahead of time. Like baked potatoes and green beans. Or some other vegetable variety. Let’s make our breadcrumbs! Heat a small saucepan over medium heat. Add 1 tablespoon of butter and allow it to melt. Then add 2 minced garlic cloves. Let the garlic cook for about a minute, then stir in 1/2 cup of panko breadcrumbs. Mix well. When the crumbs are beginning to brown, remove from heat and set aside. Now let’s cook our salmon. 1 pound of salmon should be two nicely sized filets, about 1-inch thick. Season the salmon with salt and pepper before cooking. Heat a large skillet over medium heat, and add two drizzles of olive oil. Place the salmon in the skillet. 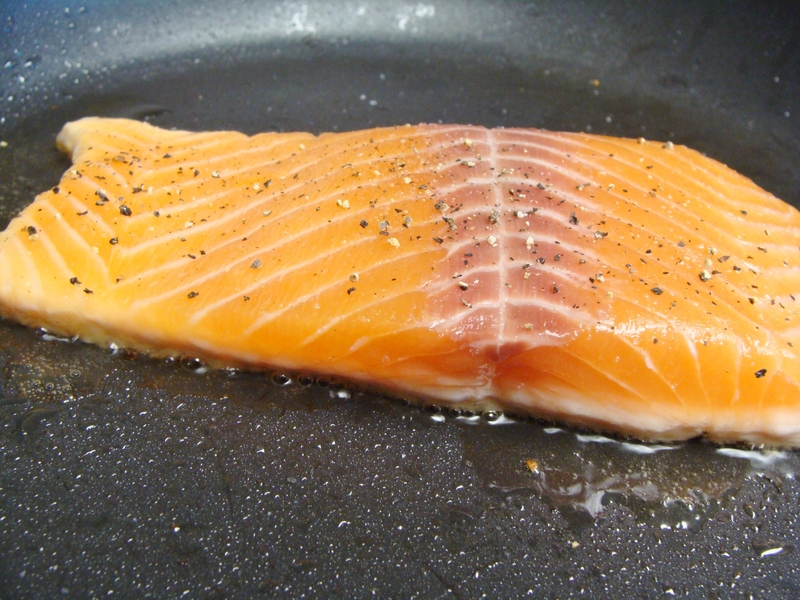 Cook for 5-6 minutes per side; the salmon will brown on each side and be opaque in the middle. Salmon just beginning to cook. Salmon ready to remove from the skillet. 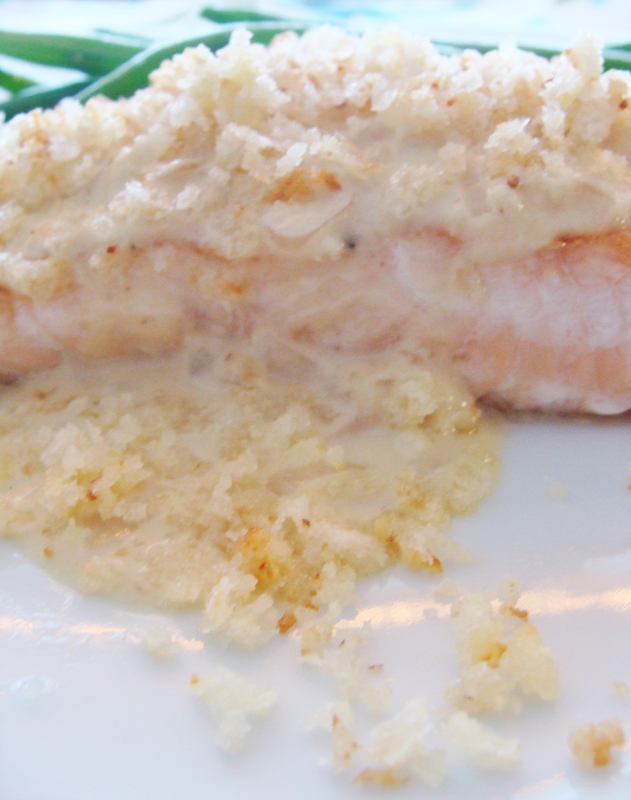 Once it’s cooked, remove the salmon and set it aside. In the same skillet, add 1/2 tablespoon of butter, the diced shallot, and the remaining minced or pressed garlic clove. Stir well for 1-2 minutes until the mixture begins to sizzle. Now, pour in the white wine. Let the wine bubble, then whisk in the evaporated milk and Dijon mustard. Whisk for another 1-2 minutes. The mixture should begin to slightly thicken. At this point, give it a taste–add more mustard if you like and salt and pepper, as needed. 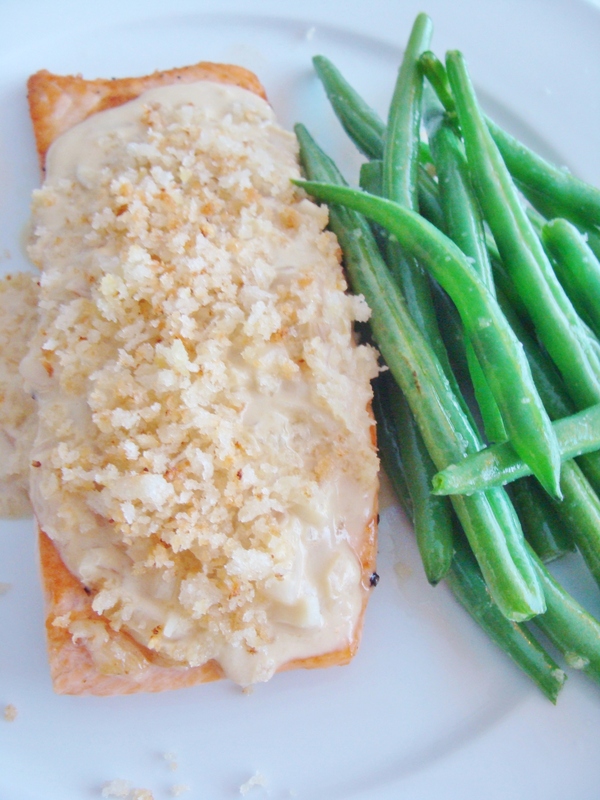 Place a piece of salmon on a plate, then pour a generous drizzle of the Dijon mustard sauce over it. Top with breadcrumbs! 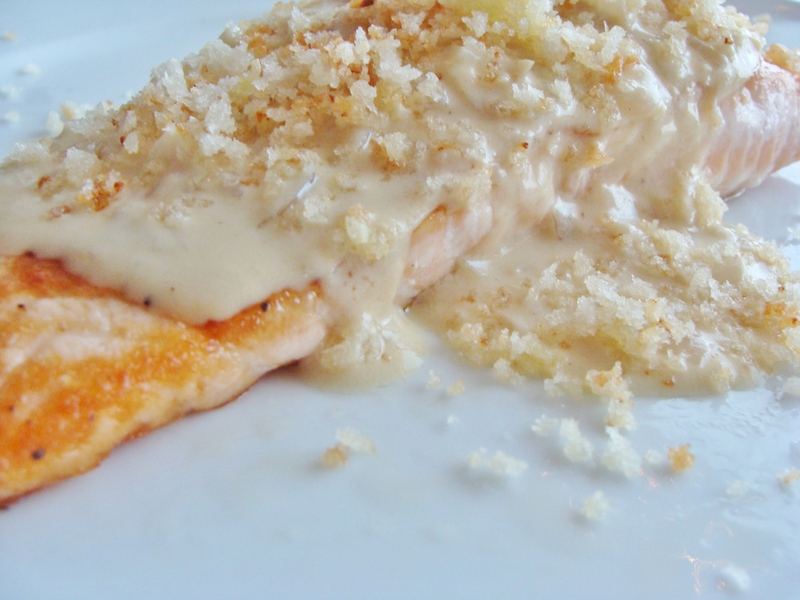 If you are like me, you will put an obnoxious amount of sauce and breadcrumbs on your salmon. It’s OK. It’s delicious! Serve it with a green veggie, and perhaps some potatoes. This is good. Really good. Trust me. « slow cooker Big Red soup. 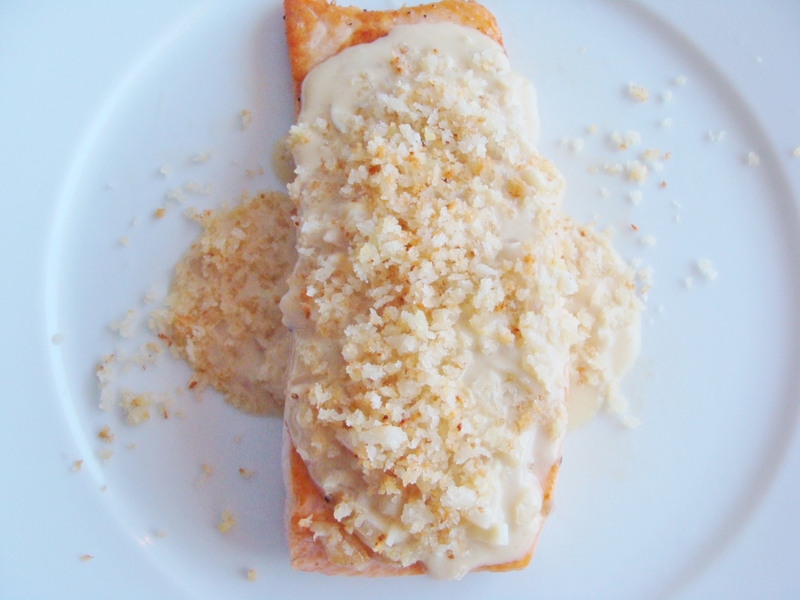 You are currently reading sautéed salmon with light dijon mustard sauce and toasted breadcrumbs. at The Cheesy Kitchen.